I filled the bill by installing an impressive amount of sensors. Cost could be 35 MCr lower without. Plus there is potential for Overtonnage: 4 tons (Air/Raft, whis could be defined to be carried inside vehicle lock). Furthermore there is serious potential for design errors. This design might be broken due to my inexperience with T5 starship design. 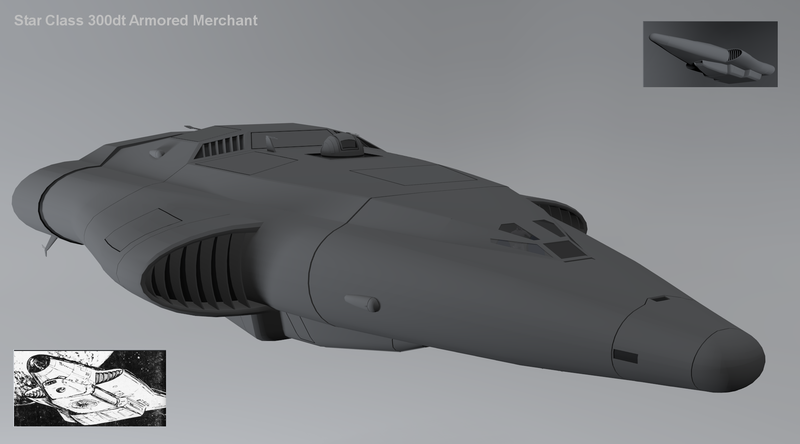 The Star-Class Armoured Merchant was originally featured in High Passage #3, a defunct magazine for use with ‚Classic‘ Traveller. 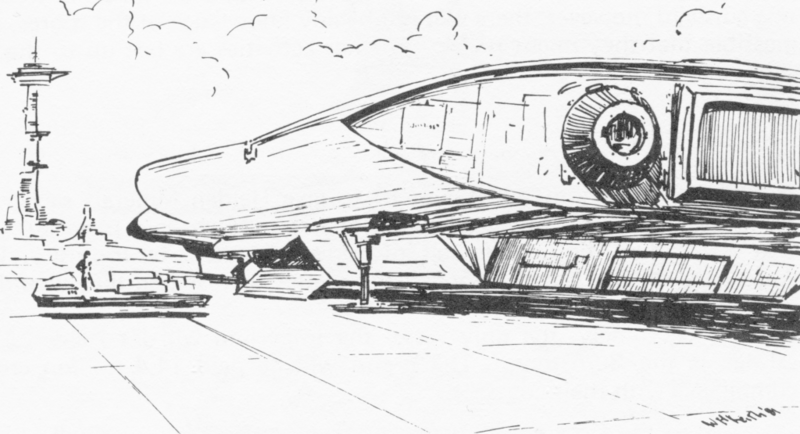 The concept was for a small ship that was armoured, yet could carry significant cargo through dangerous areas of the Third Imperium and beyond. It was created with players in mind, as the cost of this standard design is within the reach of Merchant Prince style characters. 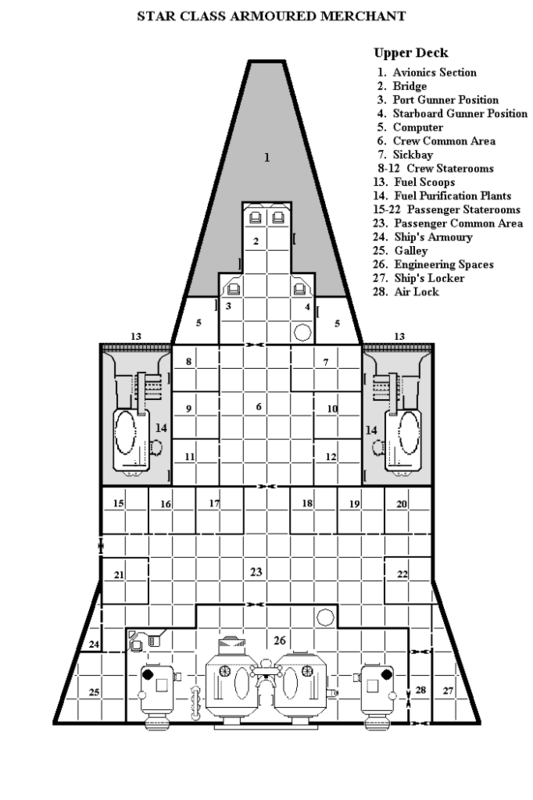 The deckplans were scanned in from High Passage #3. The design of the starship was made by Craig Johnson. 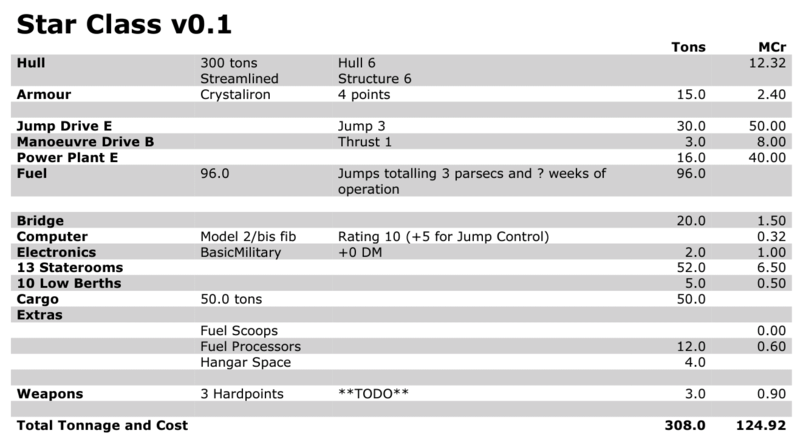 If you want to experiment with this craft design, here is the zipped source ACS-A-CS13-Star v0.41.yml which theoretically can be imported into the T5 Shipyard webapp. I had some issues to do so, but importing the whole archive worked fine: acs-archive.yml. You need to unzip the download prior to using it. 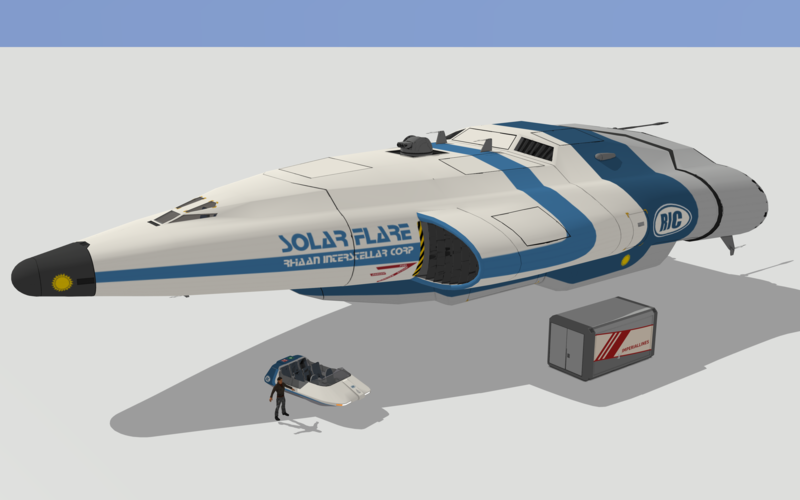 Fuel Tankage: 99 tons. Supports 1 Jump-3 & the power plant. Fuel scoops and purification is installed. Armour: 21 tons of structural reinforcement. Armour Factor 6. Crew: 8. Pilot, Navigator, Engineer, Steward, Medic, 3 Gunners. Passengers: 8 high or mid passengers, 10 low passengers.